The lack of balance in our society, is obvious, throw away dads and your have the lost of what he teaches, it takes two to give a child a chance in life, simple as that. Can anyone truly say that there is enough responsible young people out there, to carry what is left of the nation to a secure future? I think not. They destroyed a generation, what started out as a co-operation between men and women to make the world a better place was taken over by criminal predators of children, now known as the feminist movement. The only answer to this problem is for the traditional family, the strenght of moms and dads to take back what is ours and repair the damages they did. 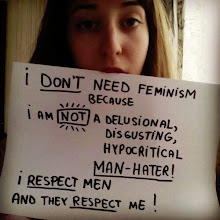 The hags aka feminism, aka feminazis has to go.